When I review music, I do it primarily from the point of view of a fan. I'm a music lover with a platform, not a music historian or trained writer (clearly). The focus will always be on the sound, the lyrics, and the emotions the songs bring out. 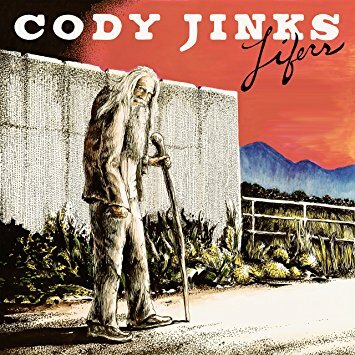 Luckily, Cody Jinks is an easy subject to cover - you know what you're going to get: modern sounding country based in honky-tonk and 70s 'outlaw' country. Some people want their artists to explore new sonic territories and "evolve" over subsequent albums. While I embrace that sort of growth, I'm more invested in artists who grow in their songwriting while hewing close to a signature sound. On Lifers, Jinks nails it. The rich vocals, steel guitar, whiskey, regret …all the things you've come to expect from Cody are here. And while he's certainly written some classics along the way, the overall consistency of the songwriting has never been better. There's a lot to be said for finding your niche and just freakin' owning it. "Holy Water" leads the way with a mid-tempo search for truth. It's a look in the mirror at a man who's been grasping for something. That something, he realizes, is spiritual in nature and the female backing vocals come in like a choir of support. Lead single "Must Be The Whiskey" was written by Joshua Morningstar. It's a loping modern honky-tonker and a thinking man's drinking song… or a drinking man's thinking song. That damn chorus is such an earworm, it's been stuck in my head for weeks. There's a lot of points to hit here, so I'm going to speed up the proceedings. "Somewhere Between I Love You and I'm Leaving" is exactly what you'd imagine from the title - a tear in your beer ballad. Jinks' vocal performance is the star of this weeper, elevating it to possible song of the year territory. Title track "Lifers" celebrates struggle and work ethic - the 'throwbacks and cowboys in old hats.' "Big Last Name" is going to be a huge concert sing-along. It's pure Texas country. "Colorado," co-written with Ward Davis, is another outstanding ballad and probably my favorite song on the album. Things take an interesting turn at the end of Lifers. The last three songs, "7th Floor," "Stranger," and "Head Case" take a cue from "Holy Water" and get really thoughtful and introspective. Honestly, I'm still trying to absorb these two, particularly "7th Floor." If you're looking for evolution out of Cody, bookending the record with songs that look so decidedly and honestly inward may fill your quota. Lifers is probably the strongest album yet from an artist who's still ascending in popularity. Who knows if it's the vehicle to be his "big breakthrough," but it's certainly accessible enough to fit the bill. Cody Jinks is on such a roll that even though he likely has little interest in mainstream radio, it's still an embarrassment to have such vibrant and beloved music exist in a world where that's not even a possibility. Anyway, stay up till midnight tonight, download the album, pour a glass of something strong, and settle in for a damn good listen. Lifers is killer.